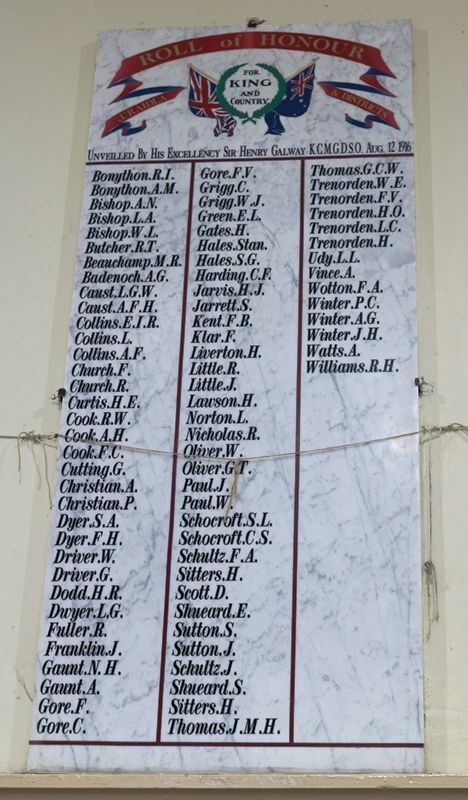 Two marble honour rolls commemorate those who served in World War One. In arranging to hold Australia Day on a date that would not clash with other fixtures the residents of Uraidla and district had to take a risk with the weather and it so happened that the meteorological conditions turned against them, for they chose one of the wettest of the season for their gala, and in consequence the pageant and other items in the programme had to be postponed. August 12, which had been decided upon as the day for the big patriotic effort, was dismally wet and bitterly cold. The clouds hung low, and shrouded the hilltops in heavy fog. From the town of Uraidla itself the surrounding hills were hidden from view, and the ram fell with a monotonous insistence that would have disheartened any but the sturdy folk wholive in those parts. A procession was out of the question, for the rain, which began in the morning, did not cease all day, out until almost the last minute the committee clung to the hope that the clouds would break in time for the pageant to begin at 1 o'clock. His Excellency the Governor (Sir Henry Galway) had agreed to unveil at 3 o'clock in the Institute a roll of honor, on which were inscribed 84 names of men who had volunteered for active service from Uraidla and surrounding parts, including Piccadilly, but at noon the secretary of the committee telephoned to Government House and arranged to postpone the ceremony, and his Excellency mentioned a fortnight later as a convenient day for him to visit the town. Chronicle (Adelaide), 19 August 1916. Unveilled by His Excellency Sir Henry Galway K.C.M.G. D.S.O.